We propose a dynamic self-regulatory processing model of narcissism and review supporting evidence. The model casts narcissism in terms of motivated self-construction, in that the narcissist's self is shaped by the dynamic interaction of cognitive and affective intrapersonal processes and interpersonal self-regulatory strategies that are played out in the social arena. A grandiose yet vulnerable self-concept appears to underlie the chronic goal of obtaining continuous external self-affirmation. Because narcissists are insensitive to others' concerns and social constraints and view others as inferior, their self-regulatory efforts often are counterproductive and ultimately prevent the positive feedback that they seek--thus undermining the self they are trying to create and maintain. We draw connections between this model and other processing models in personality and employ these models to further elucidate the construct of narcissism. Reconceptualizing narcissism as a self-regulatory processing system promises to resolve many of its apparent paradoxes, because by understanding how narcissistic cognition, affect, and motivation interrelate, their internal subjective logic and coherence come into focus. If you ask people whether they have ever met a narcissist, most tell you about a friend, boss, or lover who was completely self-centered. They describe a person full of paradoxes: Self-aggrandizing and self-absorbed, yet easily threatened and overly sensitive to feedback from others. The friend, boss, or lover was emotionally labile and prone to extremes of euphoria, despair, and rage. They were often charming and socially facile while simultaneously insensitive to others' feelings, wishes, and needs. Some might report that they were initially attracted to such individuals only to grow weary of their constant demands for admiration and attention. More formally, narcissism is defined by the Diagnostic and Statistical Manual of Mental Disorders as a pervasive pattern of grandiosity, self-focus, and self-importance. According to the DSM-IV, narcissists are preoccupied with dreams of success, power, beauty, and brilliance. They live on an interpersonal stage with exhibitionistic behavior and demands for attention and admiration but respond to threats to self-esteem with feelings of rage, defiance, shame, and humiliation. In addition, they display a sense of entitlement and the expectation of special treatment. They are unwilling to reciprocate the favors of others and are unempathetic and interpersonally exploitative. In addition, as our friends noted, they have relationships that oscillate between idealization and devaluation. Narcissists fascinate many of us, because they appear to possess such an incongruous set of characteristics and perhaps because they seem like adult versions of infantile characteristics most people leave behind early in the course of development. Likewise, the topic of narcissism has commanded a long-standing fascination in the psychoanalytic and clinical literatures and is enjoying a recent resurgence of interest from personality and social psychologists. We suggest that a significant part of the continuing scholarly interest in narcissism stems from the fact that the syndrome is highly complex, difficult to define and measure, and linked to a number of somewhat conflicting theoretical perspectives. Clinical theorists hotly debate narcissism's developmental antecedents, as well as the meaning and operations of its defining characteristics. For social and personality psychologists interested in the social construction of the self, the narcissists' preoccupation with building, buttressing, and defending its desired self takes on a particular opportunity and challenge. The syndrome provides an ideal prototype for examining how these self-processes are played out in both the social world and inside the mind of the narcissist. In short, we suggest that both the layperson's and the psychologist's fascination with narcissism lies in the challenges inherent in understanding the underlying psychological dynamics of narcissistic behavior. What keeps the construct alive as a research topic is that these underlying psychological dynamics turn out to be far more complex than the popular, intuitive conception of "the narcissistic friend, boss, or lover" might imply. In this article, we illustrate the utility of an approach that focuses on narcissism more as personality process than as static individual difference. We describe a program of research that has begun to validate a model of narcissism that casts the syndrome in terms of a distinctive dynamic system of social, cognitive, and affective self-regulatory processes. The model assumes that these self-regulatory processes are in the service of motivated self-construction directed at building or maintaining desired selves and meeting self-evaluative needs. We argue that underlying narcissistic self-regulation is a grandiose, yet vulnerable self-concept. This fragility drives narcissists to seek continuous external self-affirmation. Furthermore, much of this self-construction effort takes place in the social arena. Yet, because narcissists are characteristically insensitive to others' concerns and social constraints, and often take an adversarial view of others, their self-construction attempts often misfire. Thus, although narcissistic strategic efforts generally help maintain self-esteem and affect short term, they negatively influence their interpersonal relationships and in the long run ironically undermine the self they are trying to build. The result is a chronic state of self-under-construction, which they relentlessly pursue through various social-cognitive-affective self-regulatory mechanisms in not always optimal ways. Our work has concentrated on illuminating the dynamics of these self-regulatory attempts while concurrently refining our self-regulatory process model of narcissism. In our view, an appealing feature of this research is that it illustrates the viability of integrating within a unitary framework both dispositional (trait) and processing (social-cognitive-affective) approaches to personality that historically have been thought to be competing and mutually preemptive. The model connects narcissists' mental representations of self and their social worlds, through the strategic intra-and interpersonal self-regulatory behaviors and processes aimed at constructing and maintaining the narcissistic self. In this way, it addresses both stable characteristics of narcissistic individuals, as well as the psychological dynamics and processes that interact with the situation and underlie these characteristics. At the process level, narcissists are quick to perceive (or even impose) self-esteem implications in situations that leave room for it and then engage in characteristic social-cognitive-affective dynamic self-regulatory strategies to maintain self-worth. These underlying processes are reflected at the trait level, in terms of regular patterns of self-aggrandizing arrogant behavior, hostility, entitlement, and lack of empathy toward others. Thus, these trait-like differences in overall average levels of behaviors, cognitions, and affects are understood as a result of the operations of dynamic underlying self-regulatory processes. There is relative stability in the personality system because all processes are organized around central self-goals, yet also distinctiveness due to different situational features activating slightly different (albeit interconnected) aspects of the system. This integration of traits with process helps unravel the mystery of why narcissism is expressed through such a paradoxical set of traits. In the first part of the article, we present our self-regulatory processing model of narcissism and the research we have undertaken to validate the model, as well as relevant research by others. In this context, we also discuss some of the recurrent problems and remaining unresolved issues. In the latter part of the article, we examine some broader implications of this model, its relation to other social processing models of personality, and some of the open issues. We conclude with a discussion regarding the utility of a model that can study dispositions and processes concurrently and within the same conceptual framework, thus integrating varying levels of analysis in the study of personality. Our initial interest in narcissism was piqued by narcissists' apparent insatiable pursuit of affirming self-knowledge through online manipulation of their social environment. This core feature of narcissism is contained in both the DSM definition and clinical characterizations. Recall that the DSM-IV (4th ed. ; American Psychiatric Association, 1994) depicts narcissists as exhibiting pervasive patterns of grandiosity and self-importance, and as invested in demonstrating their superiority. Yet, despite the grandiosity, these individuals are also described as craving attention and admiration and as particularly concerned with how well they are doing and how favorably others regard them. Although on the surface this may appear paradoxical, upon further consideration, it is really not all that surprising that narcissists would have extremely positive, but simultaneously fragile self-views. The very fact that the narcissistic self is such a grandiose and bloated structure builds in an inherent vulnerability. It is a self that cannot stand on its own, as it is not grounded in an objective reality, thus it needs constant shoring up and reinforcement. It is the attainment of stable, positive self-views that narcissists seek through their self-regulatory endeavors and, as is addressed later in this article, they get what they seek if only fleetingly. The same goal of a constant need for self-affirmation is also apparent in various clinical writings, which in addition provide some suggestions for its origin. In one way or another, they all in essence describe narcissists as individuals whose self-needs in childhood were not met due to deficiencies in early parental empathy or neglect, and who thus seek to fulfill these needs in their adult relationships. For example, Kernberg (1975) ascribed the disorder to a rejecting mother and the child's subsequent feelings of abandonment. Kohut (1971,1972) pointed to inconsistent and capricious reinforcement, highly dependent on the mother's mood; and Millon (1981) blamed constant over-valuation that is not based on any objective reality. Thus, although the clinical theorists disagree about the exact etiology, they all see the origins of the fragile but grandiose self as a response to unempathetic and inconsistent early childhood interactions. Moreover, they suggest that narcissists attempt to fill the void left in childhood in their adult relationships. It seems that there may be two aspects to filling this void, both of which contribute to narcissists' quest of a grandiose self. The first is perhaps more affective and involves seeking reassurance to allay a gnawing concern of inadequacy. The second may be a more cognitive concern directed at completing self-definitional needs. Incorporating both of these components, our focus is on the repeated self-regulatory thoughts, feelings, and behaviors aimed at obtaining validation for the grandiose self. These processes are particularly interesting, because ultimately the grandiose self is an impossible goal, as narcissists encounter the reality of failures and social disconfirmations from others who do not always share narcissists' high opinion of themselves. In addition, even when narcissists manage to orchestrate confirmations, this often occurs by their heavy-handed manipulations of others to bring about the desired responses, or by distortions of those responses that are not adequately self-aggrandizing. Furthermore, presumably because of narcissists' negative experiences with their significant caregivers in early childhood, their later relationships are often imbued with hostility and mistrust. As a result, contingencies between social feedback and self-inferences most always remain somewhat ambiguous, thus continuously introducing doubts (at some level) about the validity of the social feedback. This, in turn, endlessly feeds the need for more online social construction: Narcissists must continuously "ask" others whether they hold admiring opinions of the narcissists. Toward this end, they incessantly keep squeezing their relationships for the feedback they desire. However, not only are narcissists mistrusting of others due to their early negative experiences, they also do not really like or care for them and often even disdain them. This tendentious relationship between narcissists and their "social self-support networks" is reflected in the wide range of interpersonal deficits portrayed in the DSM: their lack of empathy, feelings of entitlement, and their exploitative and arrogant behaviors. This combination of an adversarial interpersonal orientation and insensitivity to others' needs and desires, contributes to narcissists engaging in interpersonal strategies that are often counterproductive and ultimately inhibit their social networks from providing the positive feedback that they seek. This may be the ultimate "narcissistic paradox": as they yearn and reach for self-affirmation, they destroy the very relationships on which they are dependent. Preliminary empirical evidence in support of these descriptive accounts of both the grandiosity component, as well as narcissists' interpersonal impairments has recently been accumulating in correlational studies employing the Narcissistic Personality Inventory (NPI; Raskin & Hall, 1979, 1981). This self-report inventory, which is based on the DSM definition, measures narcissism along a continuum, in which extreme manifestations represent pathological narcissism, and less extreme forms reflect narcissism as a personality trait (Emmons, 1987). Consistent with the DSM grandiosity characteristics, the NPI correlates positively with high self-reported self-esteem (e.g., Emmons, 1984, 1987; Raskin, Novacek, & Hogan, 1991a; Raskin & Terry, 1988; Rhodewalt & Morf, 1995), self-focused attention (Emmons, 1987), self-referencing (Raskin & Shaw, 1988), need for uniqueness (Emmons, 1984), need for power (Carroll, 1987), and with lack of discrepancy between actual and ideal self (Rhodewalt & Morf, 1995). The NPI also has been found to be negatively associated with relationship-related variables: empathy and perspective taking (Watson, Grisham, Trotter, & Biderman, 1984), agreeableness (Rhodewalt & Morf, 1995, 1998), need for intimacy (Carroll, 1987) and to correlate positively with hostility (Bushman & Baumeister, 1998; Raskin, Novacek, & Hogan, 1991b; Rhodewalt & Morf, 1995). Furthermore, we found that those high NPI narcissists who reported the most firmly held positive self-views also had the most adversarial view of others--they reported the highest cynical hostility and antagonism (Rhodewalt & Morf, 1995). In sum, from both the clinical and the personality and social literatures one derives the picture of an individual who is overly dependent on social sources for affirmation of a grandiose, yet vulnerable self. In fact, one gets the sense that much of narcissists' daily action is geared toward obtaining, even creating such positive feedback, to which they then in turn respond with more intense emotions than others. Furthermore, others are somehow not real to them and not important in their own right. For narcissists, others are only of value in terms of what they can provide to help bolster the narcissistic self. However, because narcissists have little empathy for others and no genuine concern with what others really think, this often seems to translate into paradoxical, counterproductive behaviors that ultimately prevent others from responding in the way narcissists desire. These two defining features make narcissism an ideal prototype for studying online social construction of the self: Narcissists are chronically "working on" the (grandiose) self and see others primarily as a source of self-enhancement and as narcissistic supplies. Because their self-regulation attempts often go awry, this chronic process of buttressing and building the self is potentially endless labor, which has proven useful in illuminating the workings of these processes. The narcissistic self is perpetually "under construction", as if the construction site were on quicksand. Our goal has been to understand the paradoxical elements of narcissism by viewing their function in the process of self-construction and maintenance. The model depicted in Figure 1 is the framework we have developed to capture these elements and process relationships. (An earlier version of Figure 1 can be found in Rhodewalt, 2001.) It assumes that narcissists have certain identity goals that they pursue with more or less success through their social interactions. The main focus of the model is on the inter-and intrapersonal dynamic self-regulatory processes through which narcissists actively (although not necessarily consciously) operate on their social environments to create and maintain their self-knowledge. Thus, at the theoretical level, our approach shares much in common with other social-cognitive dynamic processing models (e.g., Cantor & Kihlstrom, 1987, 1989; Dweck & Leggett, 1988; Higgins, 1987; Mischel & Shoda, 1995; Schlenker, 1985; Swann, 1985). These models all have at their core the notion that people are active in structuring their social environments to bring them in line with their goals, rather than just passively reacting to these situations. In this vein, our approach shares a focus on what individuals do--behaviorally, cognitively, or affectively to bring particular situations and tasks (that they confront, select, or create) in line with these goals. Furthermore, although some models tend to place more emphasis on social and others on intrapersonal processes, all embrace an explicit attempt to understand the interplay of the cognitive, affective, social units and their (joint) mediation of an individual's behavior. Within a particular person or personality type, these units are thought to be organized into relatively stable configurations. Dynamic self-regulation, then, is understood in terms of this system of person units interacting with situational demands and affordances in the pursuit of goals. In our model, we employ a somewhat more specified definition of self-regulation that focuses specifically on instances when the individual is regulating contents of the self that define that individual's identity (rather than global self-evaluation or various attempts at self-control). In this sense, it shares close resemblance to Schlenker's work on self-identification, which delineates the processes and means through which individuals fix and express their identities for themselves or others through social interaction (Schlenker, 1985; Schlenker & Wiegold, 1992). Importantly, self-identifications are not simply faithful expressions or retrievals of the self-concept but rather are constructed at the time they occur in a dynamic transaction between the individual and the social context. Our use of self-regulation encompasses these strategic interpersonal attempts of individuals to bring about their desired identities. These interpersonal processes occur at the level of actual social behavior, in which narcissists strategically interact with their social worlds to construct and regulate their desired selves. For the narcissist, social interactions are the settings for the enactment of social manipulations and self-presentations designed to engineer positive feedback or blunt negative feedback about the self. However, in addition, we also include in self-regulation the intrapersonal adjustments and fine-tuning that occurs when these self-identifications are not perfectly achieved. Thus, these intrapersonal processes are the cognitive, affective and self-evaluatory activities that underlie, or motivate this behavior, or are a response to the results of this behavior. Among these are biased interpretations of social feedback and performance outcomes (to regulate self-esteem); selective attention to particular features of tasks and social environments, as well as selective or distorted recall of past outcomes or events. In our view, these intra-and interpersonal self-regulatory processes are the essence of personality, in that they give a distinctive form to the self's underlying mental system (including cognitions, emotions, needs, and motives). It should be noted that the boundary between the two is fuzzy and indeed fluid, because interpersonal maneuvers are often enacted to serve intrapersonal needs and as is shown in later sections of this article, many of the intrapersonal strategies have interpersonal consequences. Moreover, the interpersonal transactions are continuously encoded, interpreted, and evaluated internally (intrapersonally), triggering a cascade of cognitive-affective responses and further self-regulatory scripts that ultimately are played out interpersonally. In other words, consistent with other contemporary cognitive-affective processing models of personality (e.g., Mischel & Shoda's CAPS model, 1995), intra-and interpersonal self-regulation involves reciprocal interaction. The narcissistic self obtains its being through these dynamic intra-and interpersonal transactions that link the narcissists' self-knowledge systems to their social relationships. The self-knowledge component both drives and is a result of these self-regulatory processes. It represents a summary statement of the narcissist's current view of self and its social context. This includes both the cognitive self, as well as a valence statement. The cognitive self entails mental representation of the actual self (self-ascribed traits and competencies), reflected appraisals, as well as possible future selves, ideals, and goals. The valence aspect reflects one's general sense of value but also captures momentary state self-esteem. As previously discussed, the content of the narcissistic self tends to be overly grandiose, yet simultaneously vulnerable and fragile. It appears they are unable to convince themselves of their presumed grandiosity, hence the fragility, reflected in transient fluctuations in (state) self-esteem in response to external happenings. Thus, narcissists' self-esteem is high or low depending on preceding events, but these oscillations are deviations from their average self-esteem, an average that is high relative to others. Equally or more important than content in trying to address the nature of narcissistic vulnerability, though, may be the structural organization of self-knowledge. We will discuss some research we have conducted examining the suggestion that narcissists may possess self-concepts that are simplistically structured (Emmons, 1987; Kernberg, 1980). The social relationships component reflects the larger social context within which these self-regulatory processes are played out. These relationships are affected by narcissists' strategic maneuverings aimed at shoring up the self and, in turn, have an effect on narcissists' own behaviors, their self-evaluations, and their self-knowledge. 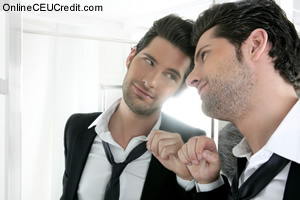 As already implied, narcissists likely prefer relationships with people who offer the potential for enhancing the narcissists' self-esteem and sustaining their inflated self-image but likely have trouble maintaining relationships as soon as the other becomes a real (i.e., imperfect, even flawed) person to them (W. K. Campbell, 1999). In short, this model depicts the narcissistic self as shaped by the interplay of dynamic self-processes and the larger social system within which it functions. As we will show, the coherent narcissistic dynamic is a chronic goal orientation aimed at getting continuous self-affirmation, while being relatively insensitive to social constraints, especially when the self is threatened. This dynamic is in part the result of narcissists' underlying self-conceptions (grandiose, yet fragile) and their view of others (inferior), which both in turn are maintained via various social-cognitive-affective self-regulatory mechanisms. We now turn to the research we have conducted in an effort to provide support for this model. In line with Cronbach and Meehl (1955), we took as a starting point what we believe to be the key characteristic of the narcissistic dynamic, namely the goal of constantly receiving online self-affirmation of the grandiose self-images, and proceeded to uncover the conditions under which it occurs. Building an interconnected system of such functional relations contributes to the validation of our self-regulatory process model of narcissism in form of a nomological net. - Morf, Carolyn C., Rhodewalt, Frederick; Unraveling the Paradoxes of Narcissism: A dynamic Self-Regulatory Processing Model; Psychological Inquiry; 2001; Vol. 12, Issue 4. The preceding section contained information about a proposed model of narcissism. Write three case study examples regarding how you might use the content of this section in your practice. Why is reconceptualizing narcissism as a self-regulatory processing system significant? Record the letter of the correct answer the Answer Booklet.